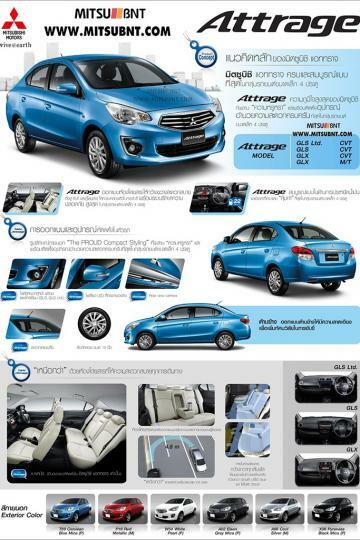 A few days after Mitsubishi showed an official photo of the new Attrage, the brochure of the new model has leaked onto the internet. 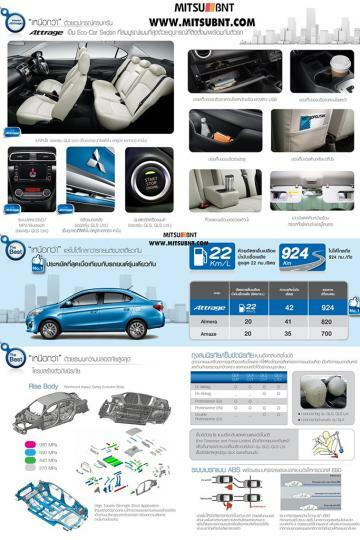 As the compact sedan will be produced at Mitsubishi Motors Thailand's factory at the Laem Chabang plant, the brochure is printed in Thai. However, we can still make some sense out of it. The Attrage will be available in three trims, namely the GLX, GLS and the top-end GLS Ltd. The GLS models will be equipped with twin airbags while the GLX makes do with just a driver's airbag. The GLS Ltd variant will get a Start/Stop button, reverse camera and MP3/DVD/Bluetooth function. The buyer can choose from six different body colours. 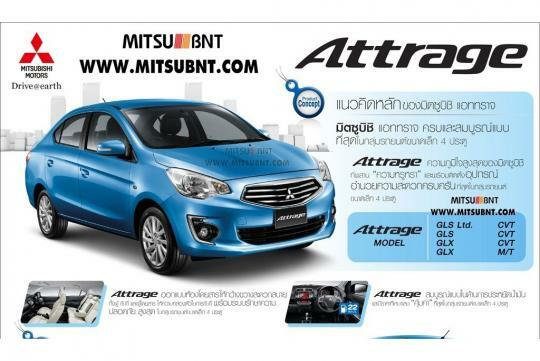 Mitsubishi claims that the attrage can achieve a fuel consumption figure of 22km/L, which is superior to its rivals, the Nissan Almera and Honda Amaze. The car is powered by a 1.2-litre three-cylinder MIVEC engine which is good for 78bhp and 100Nm of torque. Transmission options include CVT and a five-speed manual.